Dingwall A.C. controls miles of salmon & sea trout fishing on the right bank downstream from the railway bridge at Conon Bridge to the Cromarty Firth. There are 6 named pools. P ermits £30/day from Sports and Model Shop, Dingwall. Tel: 01349 862346. The Middle Blackwater is a double-banked beat extending for about 1.5 miles downstream from Rogie Falls, and comprises 12 named pools. It fishes best from June onwards. Permits from Lochluichart Estate, Tel: 01997 414212. Loch Achonachie A.C. controls salmon fishing on 2 stretches of the Conon system. The Upper Conon beat extends from below Loch Luichart Power Station for approximately 2.6 miles to Loch Achonachie. The Upper Blackwater extends for about 1¼ miles from Loch na Croic to Rogie Falls. Permits £20-30/day from Contin Filling Station, Tel: 01997 421948. Evanton A.C. control the only salmon fishing available; a mile or so of river below Black Rock Gorge. Permits £20/week from Cornerstones Cafe, Evanton. The Novar Fishings comprise about 6.2 miles (10 km) of double-banked salmon fishing split into 6 rotating beats over two sections of the river. 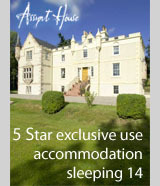 Prices from £40-95/day. Permits from the Novar Fishings, Tel: 01349 830606. 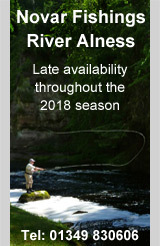 Alness Angling Club control the salmon and sea trout fishing on 2 beats of the River Alness as well as the estuary. Permits for estuary sea trout fishing can be purchased separately. Prices from £25/day. Permits from the Kardz shop, Alness.